Guitarist Ido Bukelman is one of the most prolific musicians in the small Israeli experimental, free-improvised scene. 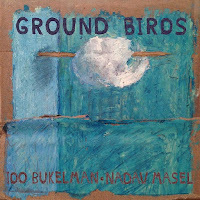 His latest releases feature two of his working outfits, the free jazz Hanut Trio and his Ground Birds duo, both with double bass player Nada Masel. 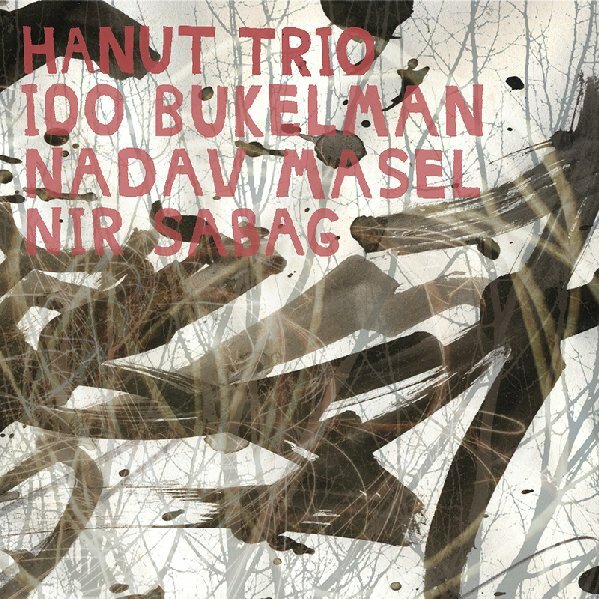 Hanut Trio - featuring Bukelman on electric guitar, Masel and drummer Nir Sabag, is named after its tiny performance home club, Hanut (Shop in Hebrew) in Tel Aviv. This free jazz trio has built its aesthetics through many live performances and ad-hoc collaborations with Polish reed player Mikołaj Trzaska and innovative Israeli improvisers as veteran clarinet player Harold Rubin and OutNow Recordings label colleague sax player Yoni Kretzmer. All the eight pieces feature loose composed narratives, six were penned by Bukelman and two by the trio. Bukelman is the natural leader of the trio, the one who usually sets the tone and the dynamics of each piece with dense guitar lines. But the interplay of the trio is quite democratic and leaves enough space for the Masel and Sabag to add color and depth. Sabag opts often for contemplative, fractured drumming while the thoughtful bass work of Masel grounds the flights of Bukelman and pulse-free coloring of Sabag. Three pieces stand out. Masel Moroccan flute playing on the short “A Flute Like This” adds an exotic, Gnawa-tinged trance-like sound that unfortunately is not developed later on. The moving, bluesy-breezy “Object Theater”. and the atmospheric, cinematic “Island”, with its intriguing sounding tension building, highlight the nuanced, varied language of this trio. The duo of Bukelman, on bowed banjo and acoustic guitar, and Masel, on the double bass, present the experimental, free-improvised aspect of their work. The pieces are associative, open ended, and Masel, again, is the one who takes the role of grounding - literally - the interplay towards a cohesive envelope. The duo was recorded live at the Barbur gallery in Jerusalem on May 2013. This performance feature Bukelman plays both the bowed banjo and the guitar while on later performances he focuses most of the time on the banjo. The sound of the bowed banjo is an acquired taste - dirty, rusty, distorted, almost out-of-tune. But when it is met with Masel’s wise, adaptive bowed double bass it forms an interesting sonic ground. A disturbing yet patient, searching ambiance, arresting in its intense timbral spectrum and its search for a common thread, only to deconstruct it immediately after. The two solo pieces stress the differences between the two. Bukelman solo guitar is a sort of free fly, free formed. It is a fast stream of associations, without any attempt to sketch any narrative, at times references the country-tinged guitar of Eugene Chadbourne and on others a continuation of his work on his solo acoustic guitar albums The Door and Solo (Kadima Collective and OutNow Recordings, both on 2011). Masel solo double bass is more solid, exploring methodically his rich sonic palette through a dark, resonating texture.